DISCOVER THE HIDDEN MONEY POWER OF THOSE WHO PRACTICE VOODOO! Researcher Marcus Bottomley interviewed 200 people in three continents to discover how voodoo changed their lives; what they do is now in print for the very first time! Money! Money! Money! You can now have it  all the time! 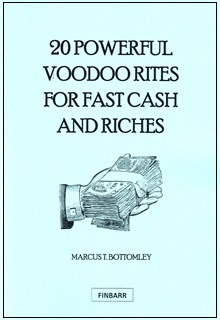 The secret rites of voodoo can solve your money problems  forever! FAST CASH IS A REALITY, NOT A FICTION, says Mr Bottomley! T.J. (Tel Aviv) won 3 lottery draws in 3 months, netting over £50,000! Out of the blue F.G. (Leeds) came into an inheritance worth £32,000! M.K. (Vancouver) landed a top modelling contract, worth a mint! THESE SECRET VOODOO RITES ARE VERY ANCIENT  AND PRIMITIVE! Only do them if you are determined to have money, money without end! YOU WILL NOT FIND THESE SECRETS ELSEWHERE. Prior to this text they have never been made public. They contain powerful stuff! They will work for anyone who believes in them, says Mr Bottomley! A struggling Scottish sheep farmer saw his fortunes miraculously transformed after using these voodoo rites. He is now rich and successful, nobody knowing the source of his sudden good fortune! R.W. (Brighton) was a cab driver not doing very well. He believed in the powers of primitive magic, used voodoo, and today owns a fleet of cars. There is no need to struggle without reward! There is no need to wait years for Lady Luck to shine on you! You can now have money  plenty of it  quickly! "I have never lacked for anything since I have been practising voodoo", says the author. J.T. (Chicago) had been thinking of closing down his store. Some days he made not even one sale, and he was tottering on the brink of bankruptcy. He turned to voodoo. I had nothing to lose, he said. I had always believed in this stuff so I thought maybe I should try it. Within a month he was making up to 100 sales a day. A year later he opened up a second store! Some folk think this is just Stone Age mumbo-jumbo  and so it may be  but it works, and that's all that matters, says Mr Bottomley! IF THEY NEVER WORKED THEY WOULD HAVE BEEN LONG FORGOTTEN, he says.